Food Truck Parks are really taking off in San Antonio. We're up to four now and I was SO EXCITED when I learned that there was finally one on my side of town. Friday night John and I headed out to The Point Park to try out the trucks. There is a small parking lot, but most of it seemed to be along the street. There was a ton of seating and they even offered an indoor seating area as well. That'll be sooooo nice come summer! There is also a big playground area and a basketball area. There were a ton of kids running around so it really is kid friendly. They have a built in bar with beer and wine. It was nice, with a lot of draft and bottle options, but you can't beat the free beer offered at other parks. The night we went there were two different Mexican/Taco trucks, an Asisan, Crepes, a burger and a shaved ice. I'm not sure how many more trucks can fit on the property though. It's very long and narrow. 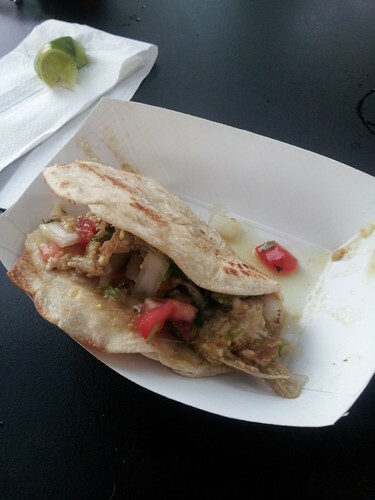 We started off ordering a burger from Blazin' Burgers, but knowing it was going to take a bit longer, we started off with a Pork Verde taco from Chela's Tacos. Just as we finished our Blazing Burger with cheddar bacon bites was ready. Oh my gosh. It was so good and the bites really were awesome. It was a HUGE burger, but we really wanted to try a bit of everything. 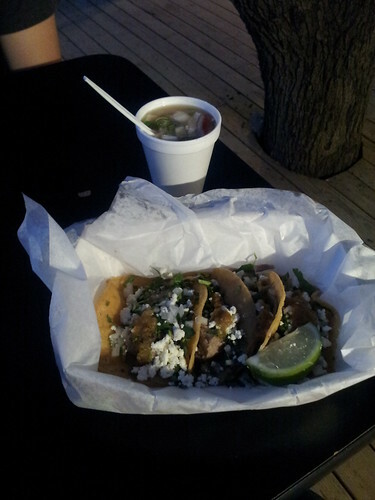 Our next stop was at Texasada Mexican Street Food where we got mini tacos made with carnitas. They were so simple and so good. Plus they were served with a cup of charro beans that had a KICK to them. 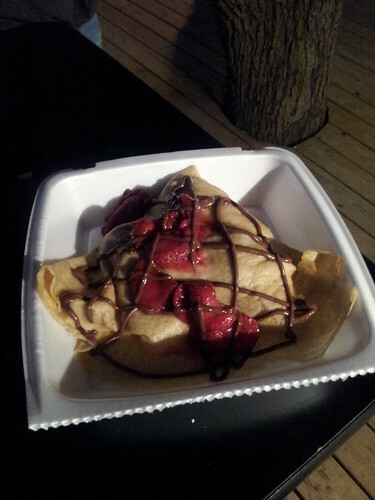 Of course we had to finish with some kind of dessert so we ordered an amazing nutella, banana and strawberry crepe from Crepe Nation. 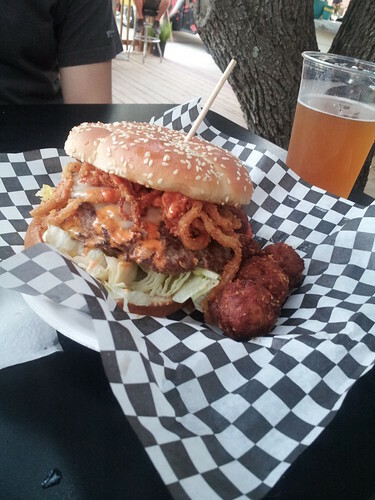 All the food was amazing but I think the first taco and the burger stick out in my head as being the best. I would have liked to try the Asian food truck but we ran out of space. Thanks for an awesome date night! This all looks amazing! We don't have any food trucks around here, but I sure wish we did!